The world’s richest team is banking on a good performance at the Tour of Flanders, after a quiet start to the season. BMC lurched into the transfer market like a drunkard on a dance floor last season, embarking on a round of rider acquisition that made us wonder if there was any point in any other teams showing up to the races. They already had Tour winner Cadel Evans. Into the mix was added Philippe Gilbert and Thor Hushovd, classics stars to bolster an already-strong one-day squad. BMC was the richest team in cycling, and they looked like the strongest team for many of the Classics. It’s fair to say that this weekend was a big target, if not a culmination of the team-building project that started last year. For the team’s press conference today in the elegant surrounds of the Broel hotel in Kortrijk, the print-out of BMC’s Tour of Flanders squad looked like a shortlist of race favourites and contenders: former winner Alessandro Ballan, former world champion Thor Hushovd, multiple Classics champion Philippe Gilbert, Paris-Tours winner Greg Van Avermaet, 16-time participant George Hincapie, former Ghent-Wevelgem winner Marcus Burghardt plus workhorses Manuel Quinziato and Michael Schär. Six out of the eight riders have won major one-day races. All the pre-race talk may have been centred around Tom Boonen and Fabian Cancellara, but on paper, if any team looks like they have the firepower to cause a shock, it’s BMC. Which is why the subdued nature of the press conference was a huge surprise. First, Thor Hushovd quietly talked down his chances, then Philippe Gilbert did the same. Team manager Jim Ochowicz admitted that the season so far hadn’t been an easy one. While Tom Boonen’s been stockpiling wins, and Fabian Cancellara doing an extremely poor job of hiding the fact that he’s easily the strongest individual in the peloton, BMC have been underachieving. With the amount of money they’ve spent on building their team, BMC should be swaggering around like yuppies in a wine bar. Instead, they look like they’re wondering when the season is going to get going for them. They had to wait until last weekend for their first win of the year when Cadel Evans, who rescued 2011 for them by taking the Tour, won the time trial and the overall at Critérium International. All that money for two wins. What’s gone wrong? Hushovd was ill and had to pull out of Milan-San Remo. Gilbert has, in the main, looked like a shadow of the rider he was last year, although he did look much stronger at Milan-San Remo before crashing out, and there have been rumours that the Belgian has been sandbagging. Alessandro Ballan, again, is competing against the backdrop of allegations linking him to the Mantova doping investigation in Italy. Apart from Evans, whose dependability is legendary, the team has misfired. Look back a year, and the situation wasn’t dissimilar. Their season, apart from Evans’ win in Tirreno-Adriatico, had been quietly mediocre. But it was the Tour of Flanders which give us a hint of BMC’s strength. As Fabian Cancellara went a minute clear and caught escapee Quick Step’s Sylvain Chavanel, the peloton surrendered. Garmin’s manager Jonathan Vaughters radioed his riders, instructing them not to chase, and to concentrate on winning third place. Chavanel’s manager Wilfried Peeters told the Leopard team car that Chavanel wouldn’t be taking any turns. “Your boy is too strong,” he said. But from somewhere. 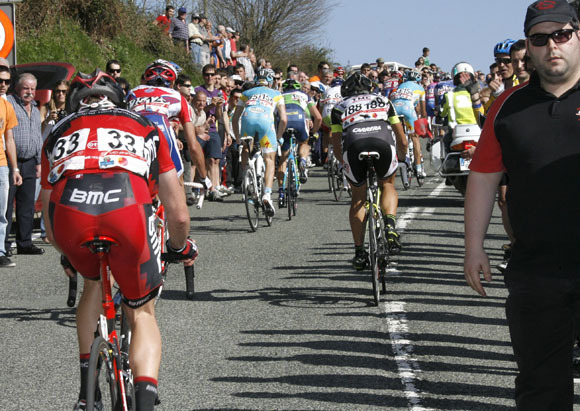 BMC found the motivation and firepower to mount a chase, seven red-clad riders in a string at the head of the peloton. The gap to Cancellara stopped going out, then came back in again, with the catch made over the top of the Kapelmuur in Geraardsbergen. Unfortunately, it counted for naught. Behind winner Nick Nuyens, George Hincapie was BMC’s best-placed rider, in sixth, with Ballan in 12th. But the race kick-started their season. In 2012, they need it to do so again. Another bad result, and team owner Andy Rihs will start wondering what his money has paid for. A win, or a podium placing, will be a step towards value for money.